Using a bicycle for transportation and recreation has become more common throughout the Chicago area in recent years. Despite cyclists’ increased exposure and the popularity of the sport, motorists still often fail to look for them when they are out on the roads. This can lead to serious, life-threatening collisions where the cyclist is the one most likely to be fatally injured. The Daily Journal reports that a young man from Chebanse recently sustained serious injuries when a van hit his bicycle while he rode on Route 45/52. According to Illinois State Police, the 17-year-old was heading north when the van, which was also heading north, suddenly went off the road and collided with him. The rider was taken to the hospital for treatment and the driver, who was unhurt, was charged for causing the accident. An insurance company may claim that their insured motorist had no fault in the accident and refuse to pay any damages. When they cannot deny liability, they may aim to place more blame on the cyclist in hopes of mitigating their financial responsibility. When others are involved in the accident, adjusters may claim that a third party is also at fault and thus also responsible for damages. When fault is clear and undeniable, many insurance companies will claim that cyclists are lying about the extent of their injuries and may even state that there is no injury at all. If a cyclist’s injury is extensive and obvious, adjusters will often minimize the extent of injuries, even when well documented by doctors. 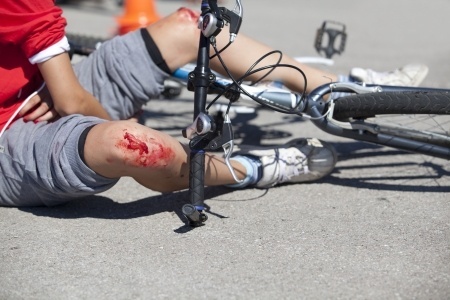 In the most classic example of insurance companies trying to remove liability from their insured, they will often claim that the injuries sustained by a cyclist were caused in some way other than the accident. To overcome these tactics, the best thing an injured cyclist can do is document everything regarding their accident. As soon as possible after the collision, they should photograph their bike and any injuries and write down everything they can remember, including weather, road conditions and traffic. Injured cyclists should also seek medical attention as soon as possible to document their medical state directly following the accident. Those who take these steps can help their Chicago personal injury attorney have the ammunition they need in order to force the insurance company to pay a reasonable claim.